Commonly used in European cooking, the globe artichoke has edible lower leaves and the centre 'heart', which can also be bought canned. There is also the Jerusalem artichoke, which is actually a species of sunflower and has a nutty, sweet taste. A velvety autumnal soup made with Jerusalem artichokes and fresh thyme served with slices of pan-fried foie gras. 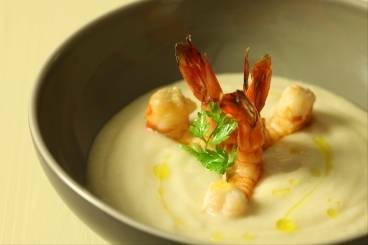 A smooth and creamy Jerusalem artichoke vélouté served with pan-fried prawns. A homemade pastry case filling with asparagus, artichoke, ham and a creamy creme fraiche and gruyere cheese filling. A pasta dish served with pesto made with artichokes and ricotta. 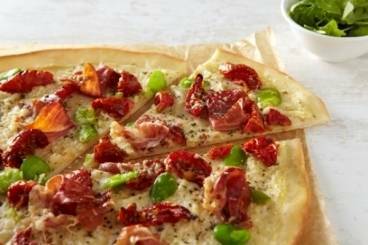 A pizza bursting with the delicious Italian flavours of artichoke, speck and parmesan. 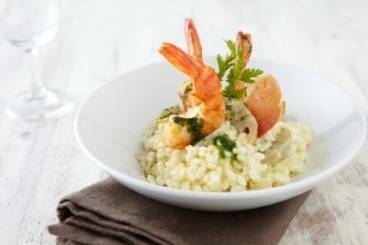 Creamy risotto with smoked paprika and parmesan, accompanied by artichoke hearts and prawns. A puff pastry pie filled with ceps, Jerusalem artichokes and served with a chestnut gratin and pink peppercorn sauce. A creamy, rich, smooth soup made with Jerusalem artichokes, served crispy skins made with the peelings and truffle oil. Al ajillo is a potent garlic sauce used in some tapas dishes. Served with Globe artichokes, or 'alcachofas al ajillo' is a common savory dish that you may find in a traditional tapas menu.